Nidri Lefkada: Nidri is the most popular resort of Lefkada, attracting thousands of visitors every summer. It is located 17 km south of Lefkada Town and only some steps away from the main beach of the settlement. Nidri beach is famous for it unique characteristics, the white sand and clean waters. A long tuft of palm trees cover the beach creating a charming atmosphere for both adults and children. The settlement is well-developed with cafes, bars and plenty of restaurants. 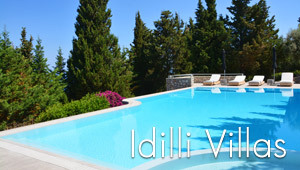 Nidri combines a warm and family environment, a picturesque landscape, crystalline waters and comfortable facilities. From the beach one can enjoy a nice view over the islets of Heloni, Sparti, Scorpidi, Madouri and the famous Scorpios, the island of Aristotelis Onasis. White sand beach with very good taverns.